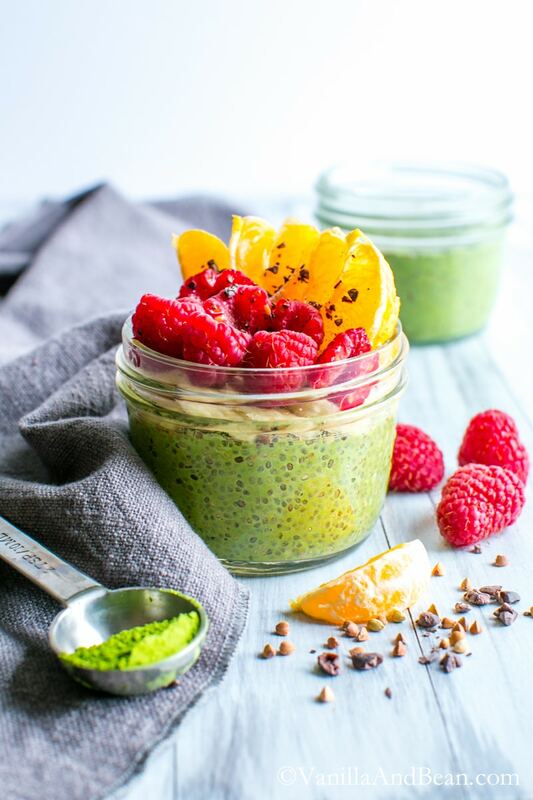 New to Matcha and/or Chia Pudding? Give this simple Matcha Chia Pudding a go. It will change your breakfast routine. It’s not weird. Promise. vegan + gluten free | Disclosure: The post is sponsored by Encha Organic Matcha. All opinions are my own. I’ve discovered Matcha, ya’ll. Are you familiar with this vibrant green tea? I’ve probably had my head in the sand. I discovered it about three years ago, first while in pastry school. My friend made some of the most beautiful petite fours and chocolates with it. It tasted divine. When I went to buy some at the store, I decided it cost too much. End of story. Fast forward two years later when I gave up coffee (read, sugar) for something better for me. Drinking sugar was no way to start the day. I knew this but ignored it far too long. And no, I couldn’t just drink it without sugar. Now, don’t get me wrong, I still have a cuppa, it’s just less frequently than every day. I started drinking different varieties of tea and was already feeling less sluggish in the morning, so I continued my daily tea, much less coffee, routine. It wasn’t until later that year at a conference, where I was invited to sample different teas, I was reintroduced to Matcha. I recalled reading about its health benefits, so I knew I had to give it a go. Besides, I had given up most of my coffee and when I compared the price of Matcha to coffee (I make lattes at home), they were about the same. Price was no longer a dealbreaker. I bought a packet and started drinking it mostly in my favorite morning smoothie. I wasn’t really taking note at that time with how I was feeling, but knew without that morning coffee, I didn’t feel sluggish and had sustained energy throughout the morning. I felt like there was something to this whole Matcha thing I’d been hearing about. The flavor of Matcha is earthy, somewhat grassy and slightly sweet. It is a full-bodied green tea when whisked with water. It’s different then tea you find in bags. Matcha tea is select whole tea leaves ground to a very fine powder. It can be used in smoothies, lattes, ice cream. I’ve even seen it baked in waffles! So you can imagine when Encha contacted me about trying out their Organic Matcha Tea, I was excited to try it. 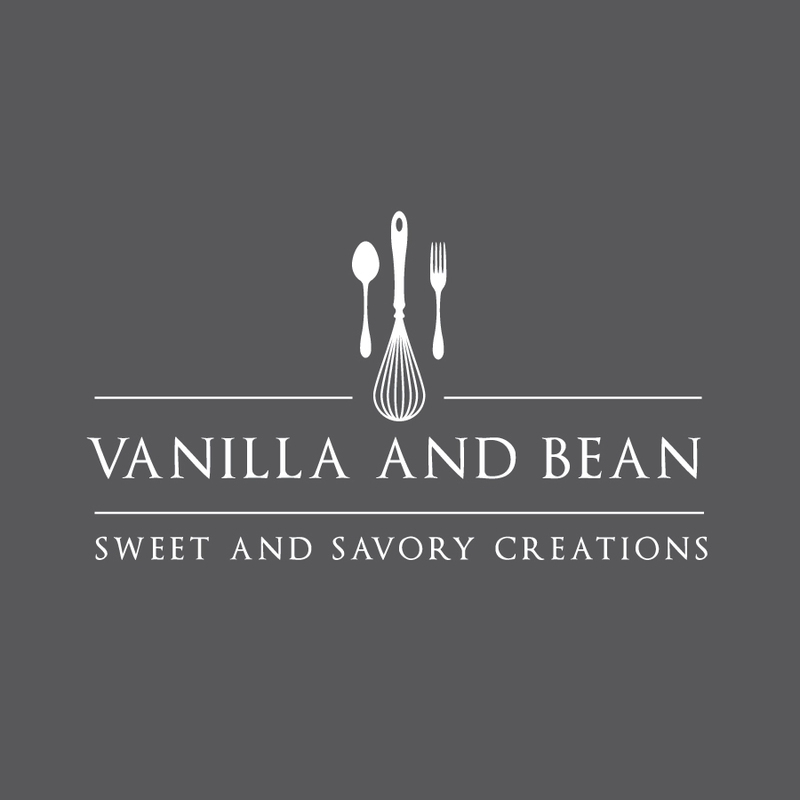 I like to drink it in a latte where I whip it up in the Vitamix with my favorite Cashew Milk and pure vanilla extract. This is when I started documenting how I felt over several days after drinking a Matcha latte each morning. What I noticed most was my sustained energy throughout the morning. Not a jittery energy, but a calm energy. This is a benefit, yes, but it goes beyond short-term health effects. Matcha is rich in vitamin C, packed with good-for-you antioxidants and contains the amino acid L-Theanine which calms the body and promotes alert awareness without headaches or caffeine crashes. While it does contain caffeine, it is about half that of coffee (source: Worlds Healthiest Foods and Encha). Equally important, Encha Matcha is organically grown. Supporting organic farming is important to me because instead of degrading the environment with chemicals, synthetic fertilizers and polluted runoff, organic farming supports biodiversity, improves soils, reduces water use and minimizes hazards to farm workers (source: NRDC). Better for us and our planet. I find the best way to support organic farming is by voting with my purchases, as much as possible. Since I was enjoying those Matcha lattes so much, I decided to try chia pudding for the first time several months ago and include Matcha in the pudding. I used to think Chia pudding was a fad or just plain weird. But I had been reading about chia pudding and seeing beautiful images of it on Instagram. It was time I stepped out of my box to see what the big deal was. Chia pudding is a quick, easy-to-make, make-ahead, grab-and-go breakfast when you’re flying out the door. It’s filling, nourishing and tastes slightly sweet with the earthiness of Matcha. I think it’s divine. And y’all, shut the front door. Rob even said it was good (cue bug-eyed emoji). Not only does this make a fabulous breakfast, but also a delicious snack. I hope you’ll give Matcha Chia Pudding a go. It’s not weird. Promise! 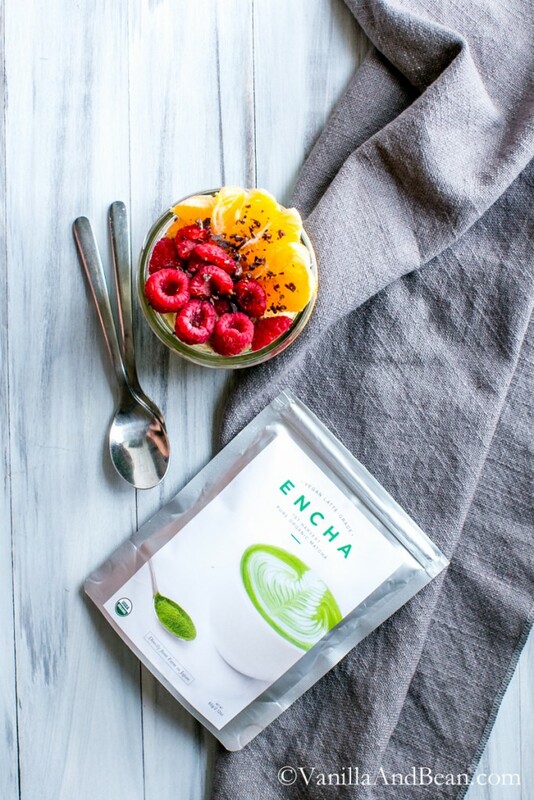 You can find Encha on Facebook, and Instagram or on their website where you’ll find more about the benefits of Matcha. So what’s your Matcha story? Leave a comment below and if you have a favorite Matcha recipe, drop a link! I’d love to know! A nourishing make ahead, grab-and-go breakfast for those fast-paced mornings. Use your favorite milk and have fun with the toppings! 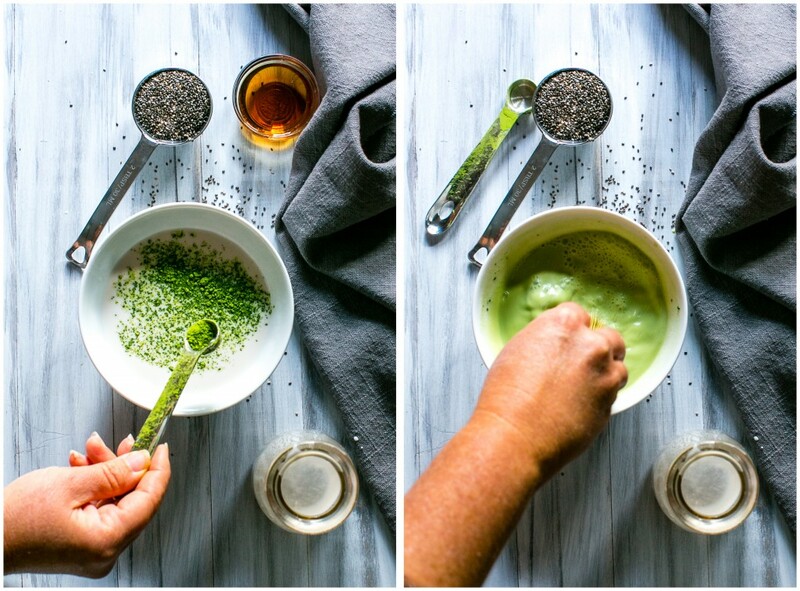 Matcha Chia Pudding is a blank canvas! 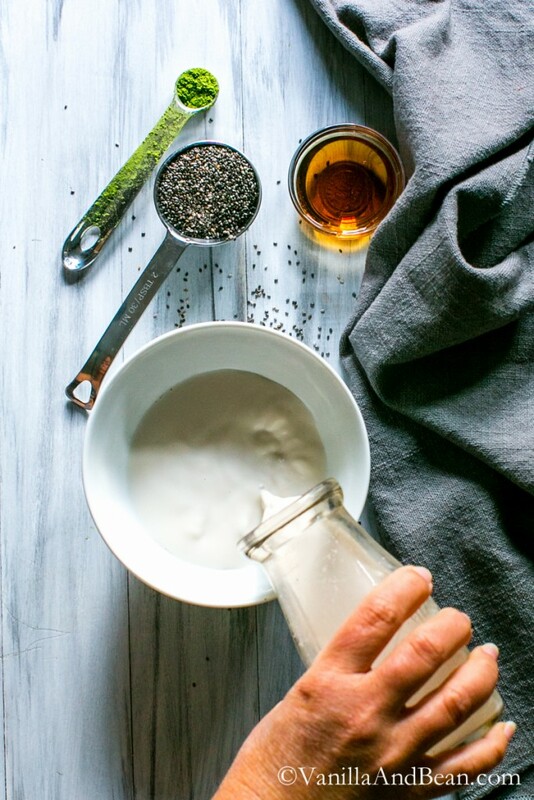 In a lidded container, I use 8 oz Ball jars, add milk, maple syrup, Matcha and chia seeds. Shake vigorously to mix throughly. Allow to sit 10 minutes, shake jar again so the chia seeds don't stick together, then allow to set at least an hour and a half before serving. I typically leave mine overnight to be enjoyed the next day. Alternatively, if spooning the chia pudding into bowls instead of individual serving size jars, you can make it in one batch using a larger jar. 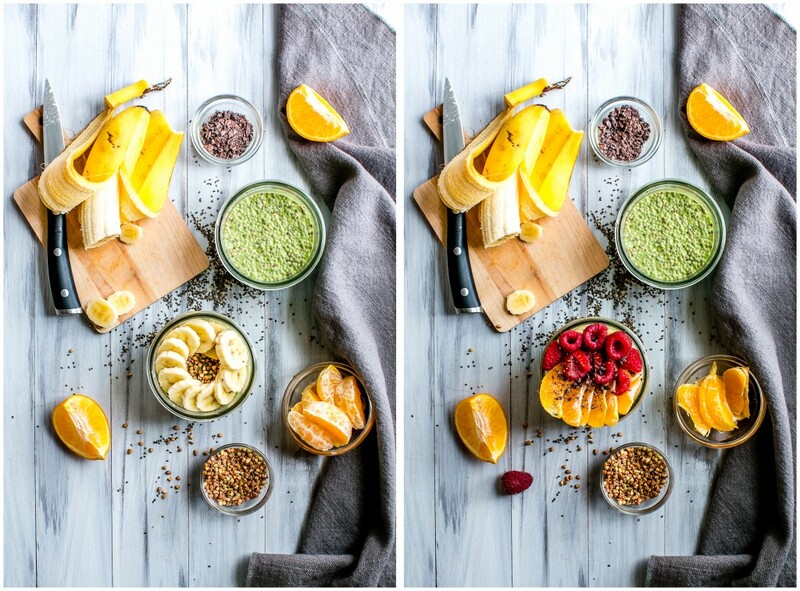 When ready to eat, top with desired fruit and/or other superfoods. Chia pudding can be stored in a lidded container in the refrigerator for up to three days. I have diverticula and cannot use seeds, nuts, or good stuff. I am wondering if I could make Macha oatmeal, and not use the chia seeds. I will try it with overnight oatmeal since it is getting warmer fast! Will let you know. Hello Frances! Thank you for your note… looking forward to your results! Did you use warm oatmeal or overnight cold oatmeal? 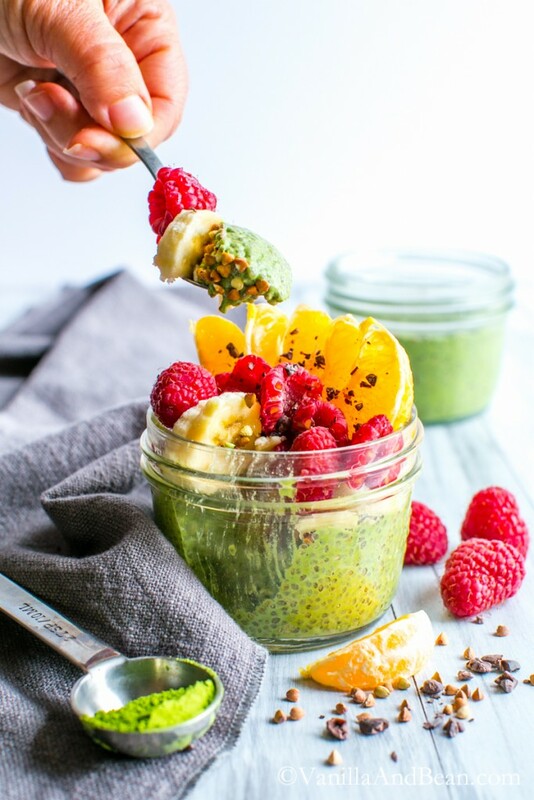 Traci I’ve never made chia pudding but am a lover of matcha and I look forward to trying this recipe. Your pictures look so yummy. Thanks for sharing. Hey Leslie Ann… thank you for your note! I hope you enjoy the chia pudding. To make this truly vegan, use Agave instead of honey. I have made this before, but never with the matcha, guess what is for breakfast tomorrow??!! I must admit i really envy your food styling and photography skills, great work! I am a Matcha tea lover but never heard about Chia Pudding. I am bored from my regular breakfast and always thinks that what new I can try in lesser time which would delicious. Here’s now I found in your blog. It contains fruits and also loved by my children. Thanks Traci for such a good recipe. Let me know if you have more recipes with Matcha Tea. Okay, I am going to be honest here. I cannot stand the taste of matcha. Here, I said it. Though after seeing this recipe I am giving it a second thought to try it. Or perhaps I can make it for my husband, who looooves matcha (but hates millet polenta – go figure!) and taste his. Beautiful, mouth watering photos even for non-matcha lover. I hear you, Aysegul! I’ve talked with others who don’t either. Drinking it straight with water is not something I prefer… so I use it in lattes and puddings.. with a touch of maple syrup. It helps to balance it’s bold flavor. Do make it for your hubs! He’ll love this if he loves Matcha! Haha.. Millet. You know, Rob throws a fit when I make Millet!! It’s so frustrating because it’s soooo good! hehe! Just goes to prove yet again, all of our palates are different! You just said it.. there’s a word.. “non-matcha”! hehe! I’ve been seeing Matcha pop up all over the place recently, but haven’t tried it out for myself, yet. I love what you’ve done with it here, it looks gorgeous with those sunny fruits piled on top! Oh that’s so good to hear Lisa! Isn’t it fun finding new ways to use it? I’ve not made raw balls yet.. I’ll have to give it a go! I hope you enjoy this my dear! 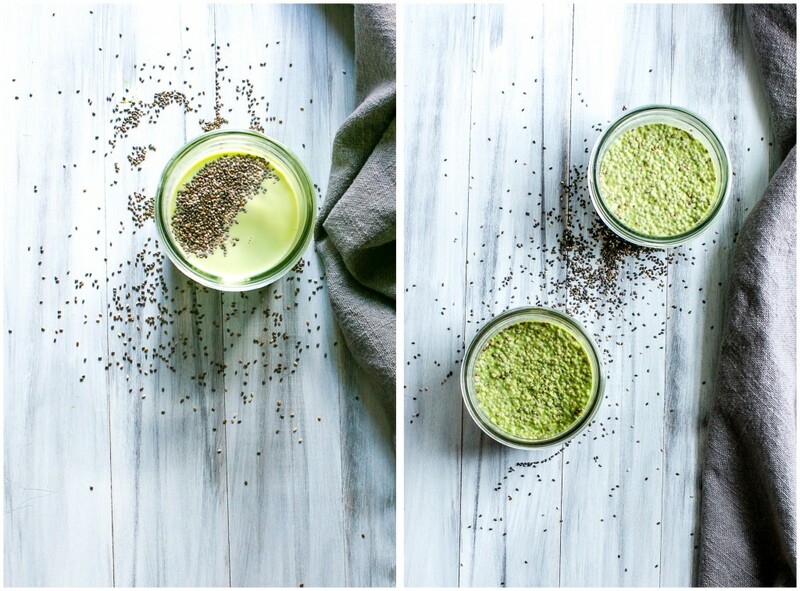 OMG, matcha AND chia, two things I have been meaning to try forever! I am just like you, I have been seeing them everywhere but for some reason haven’t gotten around to trying them yet. I love that you combined them to make this gorgeous match pudding! Must try this! Pinning it! You’ve completely just inspired me to dig my matcha out from the back of my tea shelf and give it a go again! 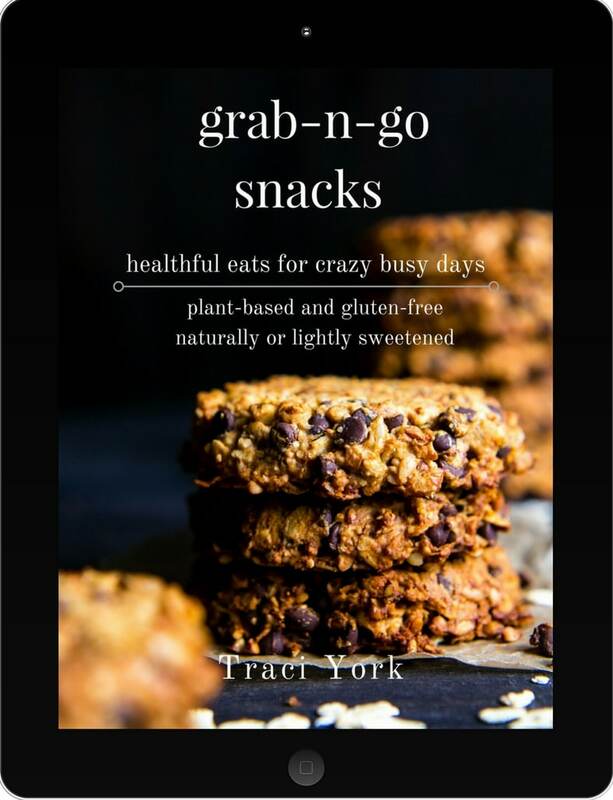 Your photos here are so bright and appealing and I cannot wait to try this, Traci! I’ll have to keep my eyes open for encha too! This looks like a delicious way to combine star ingredients – including the fruit! My husband travels to Japan a couple times a year and you can probably guess my favorite part about that :o) new to North Americans maybe, matcha is one trend that is likely to endure. Glad you’ve found a latte that works for you – agreed, adding sugar to any drink (tea, coffee or otherwise) can play havoc with blood sugar levels and queer the pitch. Beautiful pudding Traci… cheerful and inviting. 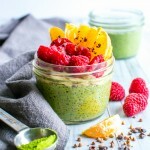 Matcha chia pudding is one of my all time faves, Traci! 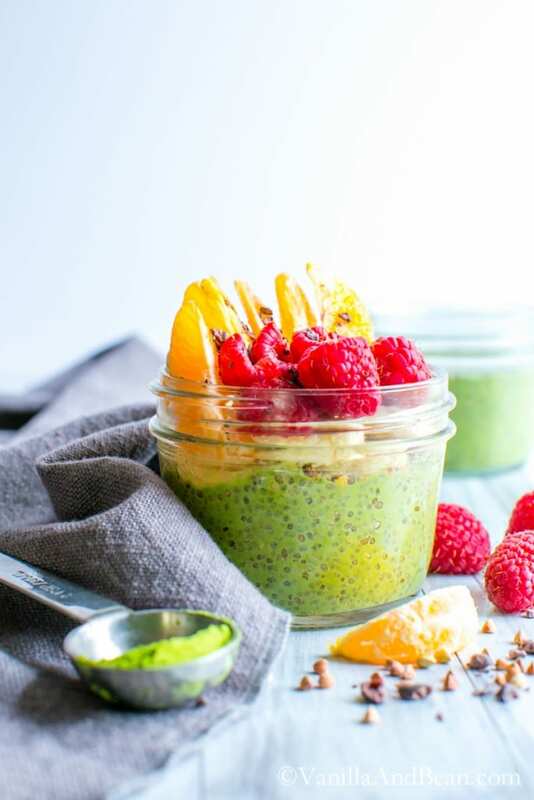 I love the mellow, subtle flavor of the matcha and the lovely green color it adds to otherwise pale chia pudding.Your rendition here is so beautiful! It is!??!! Oh Gena! I love hearing that! No doubt, the color of matcha is so invigorating and it is so subtle. It adds a earthy freshness to chia pud. So happy to have finally given it a go! Thank you my dear! Can you give me a photography lesson please?! These photos are beyond stunning – I’m swooning over here. I cut out coffee and replaced it with tea a few months ago, but I haven’t tried matcha! You’re inspiring me, it looks like a need to try it out, especially so I can whip up a bit of these gorgeous chia pudding. Come on up to the Island (not Kauai – I wish :D ) and we’ll bake together! We can swap photog note too… so fun! Anytime, Rachel, seriously! Go grab some matcha, you’ll love it…! Aaaamazing. I couldn’t stop eating this Matcha Chai pudding. The flavors are perfect. Have it any time of the day! So glad to see you discovered Encha, Traci! It’s such high quality matcha and I also love that it’s farmed organically. This chia pudding is a brilliant way to use it. I can’t get over how gorgeous those colors are! Just stunning!! Super excited about the chia pudding situation happening here…but I’m scared of matcha. Although you might get me with the ‘sustained energy’. Is it really true?!?! Ok, so admittedly I haven’t gotten on the Matcha train yet. But I’ve been seeing it being used in so many creative ways, including your pudding here, and I think I need to run right out to the store and buy me some! The colors here are just gorgeous, Traci. Like a little ray of sunshine! I love the idea of waking up with a vibrant healthy meal like this. Matcha is one of my favorites to bake with and drink, so this pudding is something I definitely see myself making. I am going to have to look up Encha. I love brands that are socially focused and are concerned with bettering the planet. Oh how fun Amanda! I’ll check your site when I start baking with it! SO fun.. I just love it’s vibrant color. Encha IS one of those brands. Read the about section! This post is coming at the perfect time. I’ve just started looking into matcha. And your description of calm energy is what I’m looking for in the morning. I’m cutting back on sugar and dairy and have been drinking my coffee black but it’s a bit too much in the morning. I’m a little confused by the grades though. There’s culinary grade, ceremonial grade and now I see you’re using Latte grade. Is Latte grade the type to use in smoothies? Let me know what you think. And I have yet to try making Chia pudding – but putting it on my to do list – love how you’re promising it’s not weird! Pretty pictures as always! I hope you’ll give it a go Rita!! :D Thank you my dear! Looks gorgeous, Traci! I love your pudding! Yum! These little jars are so beautiful! I love love love matcha. Just need to pick up some chia seeds so I can make this! I’ve had tea but never matcha; I’ve had pudding but never chia…it’s time I join in on the fun. I love how bright and glorious this is…packed with so much goodness! Thanks for the insight! I can’t promise I’ll give up coffee (yeah, no, I can’t) but – I can add to my morning or maybe afternoon with a wonderful cup of tea! Thanks, Traci! What a delicious little cup of yummy goodness Traci! I have tried matcha tea, but I have not tried chia pudding yet. I guess I have my head in the sand on that one! This looks so pretty and sounds so delicious though, I think I shall give it a go!